I’ve been reflecting regularly on my communities at Dartmouth during this year of absolute uncertainty and, at times, great disappointment. As the number of medical school interviews I’ve had is far smaller than the ceaseless number of emails flooding my inbox stating schools’ regret in not including me in their Class of 2023, I first wonder: Why the heck did no one warn me about how endless and discouraging the application process can be? For all you Econ gods and goddesses, primary applications are submitted in June, and after additional essays tailored to each of the 15 to 20 schools and interviews in the fall and winter, decisions may not be sent to applicants until March or April. I thought sitting through courses like organic chemistry, in which midterm medians wavered around a 49 percent, was torture enough, and that tackling the MCAT would be the toughest uphill battle. But the application year monster has made attempts to ravage, devour and spit back up my self-confidence in a round, soggy ball. The second question I contemplate is how I would have made it through these last 10 months without my Dartmouth communities: my friends taking me to dinner on bluesy nights, my undergraduate advisor staff team encouraging me every Thursday night in a stuffy Topliff basement lounge, my Student Assembly co-leaders distracting me with unending checklists accompanied by hearty laughs and futile attempts to teach me step. My spirits remain high because of texts filled with heart emojis and thousands of exclamation points and hand-written notes that are full of gratitude for the friendships built over the sweaty afternoons of Sophomore Summer or the unpredictable, adventurous (and therefore probably sweaty as well) nights of Pre-Orientation. It is the smiles, hugs, laughs — my friendships — that make me the positive person I am today, energetic about whatever opportunities the future may hold. Recognizing my friends’ commitments to my wellbeing, I dedicated a couple hours each afternoon this past winter term to molding mugs in the ceramics studio. Carving Baker Tower, brains, roosters and love letters into leathery clay, adorning each mug with a handle to fit a friend’s personality, has allowed me to spend my energies thinking about how to best represent others, which takes my mind off of my own worries. Celebrating friends by handing them a product made from love and pruney fingers quite literally re-energized me, as my dopamine, serotonin and oxytocin saturated my brain during the acts of gift-giving. If caring for our classmates provides a natural high, why do we students at Dartmouth so often catch ourselves in a rut of focusing internally on our own negative stressors? In all fairness, college is a time to be selfish — a time to compile a portfolio of experiences that will secure one’s childhood dream job among other penguin-suited coworkers. However, it is also meant to be a time of growth and maturation — a time to practice common courtesies, to stimulate community-building and camaraderie, to raise up friends and highlight their greatest qualities. In the aftermath of campus negativity, exemplified by distasteful messages of hatred and chilling threats that we on Student Assembly have done our best to respond to as students reach out for additional support, I feel compelled to motivate students to reevaluate how they are fueling campus climate. Are you a spark, ready to kindle your friends’ days? Are you more likely to wave at someone you met once during Orientation, or do you swiftly duck your head at most oncoming walkers? 1. Open doors for each other. 2. Help pick up someone’s spilled pens, pencils and sticks of peppermint gum. 3. Tell a student athlete that you’re in awe of how they handle two-a-days, lift and away games or races among the other roles they play on campus. 4. Acknowledge your classmates who work the 7:30 a.m. or 1 a.m. Novak Café shifts and, by some will of sheer determination, still manage to maintain their schoolwork. 5. Become a undergraduate advisor who makes Dartmouth just a little bit safer by bringing together diverse groups of people in their first year of college to create a community, a safe place and a home. Forge a place where individuals can feel comfortable to air their discomforts during a year of incredible transition. 6. Join leadership positions in the Greek System — not for the fleeting clout or social status — but rather to protect the vulnerable individuals in your spaces. 7. Run for a position on Student Assembly to pour your heart and soul into making lasting change for Dartmouth that might just make a small difference for marginalized communities or undergraduates in general. One last piece of advice: DON’T write racial slurs on people’s dorm doors or draft threatening emails making a peer feel unsafe in her own space. But don’t take my word for it — try the exercise for yourself: write a handwritten note telling someone how much they mean to you and see if it turns your day around, allowing you to forget about whatever is going on at home or in your biochemistry class. 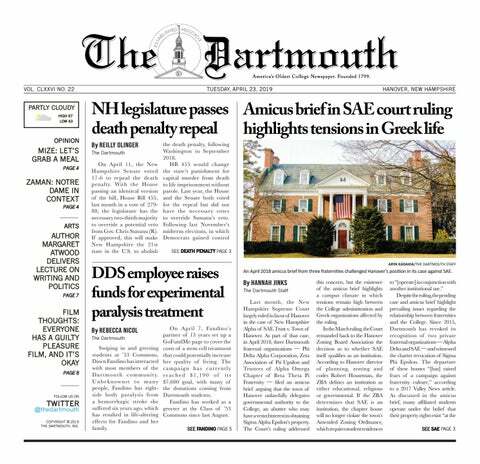 Wouldn’t you rather the “Dartmouth family” be a reality, an institution in which students are recognized nation-wide for developing supportive programs instead of for a reputation muddied by never-ending reports of sexual assault and racial bias? This rural New Hampshire campus is frigid enough to begin with: be that supplemental dose of vitamin D in someone’s cloudy day. Please, let’s be kind to each other, Dartmouth. Knape is the vice president of the Student Assembly.